Now, how to pull it all together in a travel journal layout..
Where exactly on the page do you start? 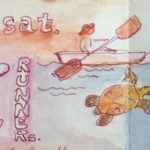 But, I know from experience it can feel quite daunting staring down at a big blank journal and like a rabbit caught in the headlights – the white of the page freezes you. You really don’t know where to begin! Or if you travelled during the day, replicate the compass directions you took and position yourself on the page as per a map. Now, grab a scrap of paper and as you read each of these three examples expanded upon below, give each method a go by story-mapping what you did – say, one day last week. Just like creating a mind map, start in the centre of the page and name the place where you woke up! Branching out, use each of the four corners for a segment of the day – morning, midday, afternoon & evening and record the highlight that happened at that time. Below is a fixed image of the five stages I’m suggesting – although if more events happened you can always add in more! To give the above template some life, below is a simple example of what I did last Friday, when I went up to the city to meet up with a friend and then went to the Gallery of Modern Art! 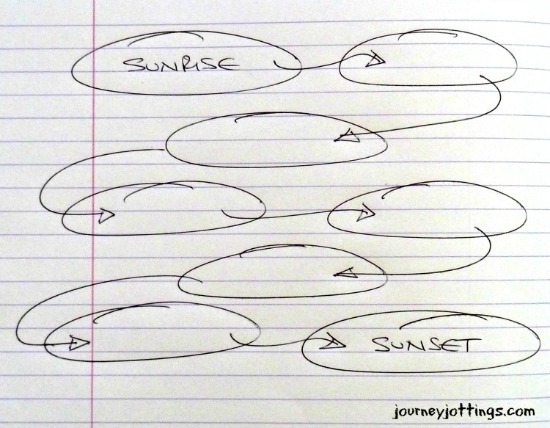 Snaking your way through the day can be a good way to create a story map where you either don’t want to feature a central pivot point or, where you start the day in one place and after a variety of experiences you end up somewhere else by nightfall. Adding arrows between each experience will connect your pictogram symbols and/or written notes so the day will visually flow from start to finish and your story will be mapped before you’ve even realized what happened! I love incorporating a rough geographic layout into my story-maps. Particularly if the day has involved some travelling. This does not mean to say they’re accurate renditions that are to scale in any shape or form – they’re more of a mud-map! But if for example I headed north I’d lay out the events of the day starting at the bottom of the page and heading northwards to the top! Using these as a template I copy where the main features of the region we’re visiting should sit on the page. On this travel journal layout, we had had a fairly uneventful drive of about 100 km (60 miles) to get to the Cahills Crossing area on the edge of Arnhem land in Kakadu National Park where we spent the day exploring. I therefore focussed the story map on that section of the day adding a line of text along the bottom of the road as it came onto the page (bottom left) giving the details of where we had come from. I use pencil initially so I can erase it if my sense of scale is so way off I find myself going off the edge of the page before I’ve fitted in all that I want to include – and need to start again! Once I’m happy with the rough layout, I go over it solidifying the lines with pen. solid double lines for the roads – I don’t worry about keeping the double lines exactly parallel as I feel their varying width adds a sense of movement. dotted lines in red to show the route we took – which I put inside the roads. dashed lines for sections we walked. I used red arrows alongside the road to show the direction we travelled and to indicate the order in which we visited the sites. By adding numerals to the actual location on the story map, I was able to then create a numerical list down the side writing alongside them the relevant extra information I didn’t want to forget. 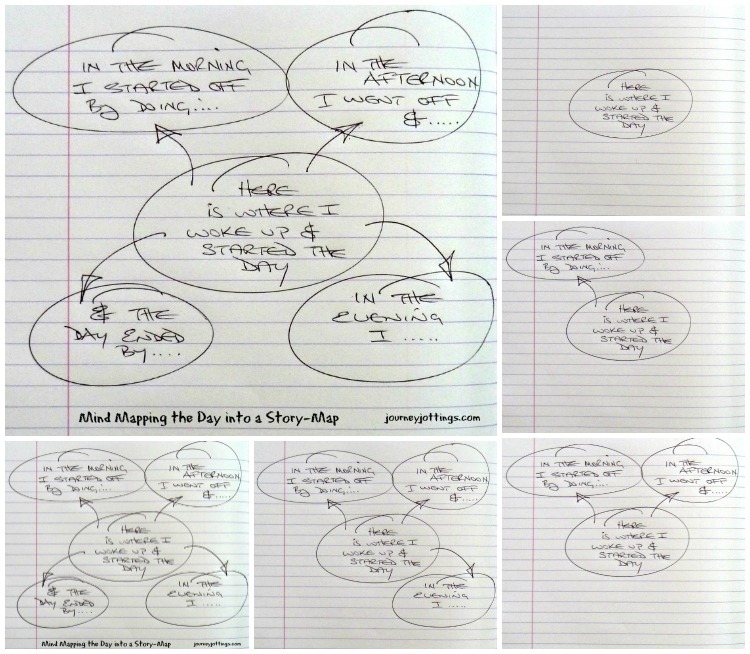 So, did you try laying out a story map of a day (or two) from last week? Or, are you still feeling flummoxed? If you enjoyed this post why not sign up to get notifications when I post more? 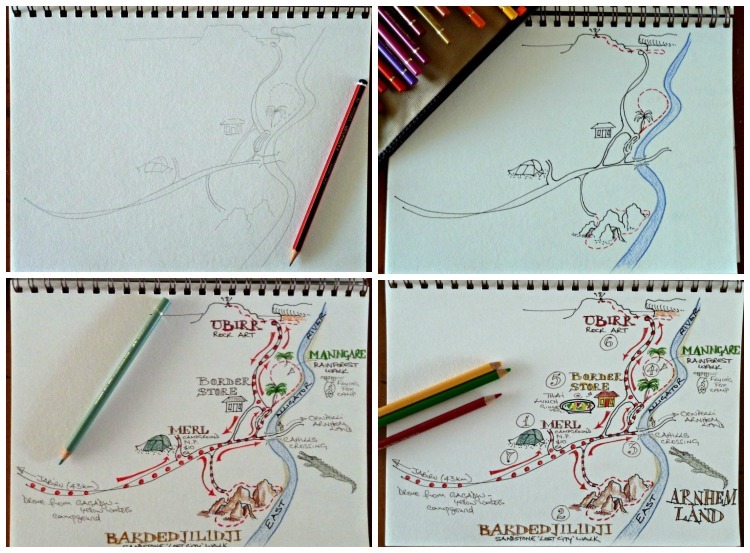 Travel Journal Ideas - Why Write When You Can Have a Travel Story-Map? 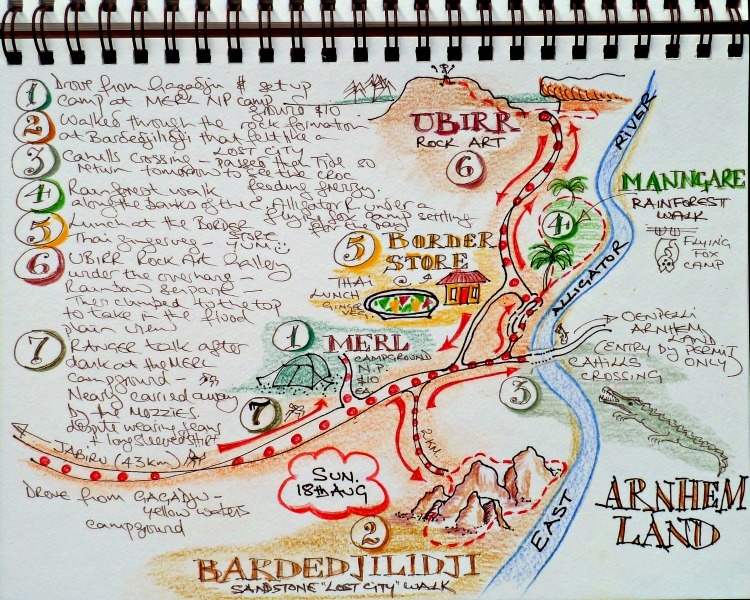 This entry was posted in Creating Story Maps and tagged layout, story map, travel journal by Linda. Bookmark the permalink. You may be pleased to hear, everyone can draw! Take a look at Drawing on the Right Side of the Brain by Betty Edwards. I love this idea, but I’m not sure that I would be thrilled with MY results. Maybe when I’m on holidays this summer I’ll give it a go. We’ll see. It may be a case of the process being more important than the product! Your finished story map looks so beautiful I think I’ll try creating a story map on my upcoming trip to Turks and Caicos. Those look like ordinary pencil crayons (no?) you’re using but does it matter what kind of paper a person uses? Standard computer paper is about 80gsm – I’d go for about twice that if possible – say 150gsm – It will give you more substance and texture. It seems like your story map would also be a great tool for writers to tell a story without pictures, too! 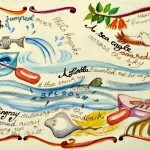 Linda, I love all your great journalling tips and the great illustrations. They are really motivating. Very cool, I loved following the visual journey and process seeing it from an artist viewpoint. thanks for sharing this. Love the bookmarking feature – I have folders of fabulous reference material in Evernote! Looks to me as if you could be illustrating New Yorker covers! Another great lesson, Linda. I’m looking forward to the day when I can start to put all I’m learning to task. Thanks for sharing all of your insider tips and tricks! What an inspiration you are for making creative maps that look so great. I have to get the book – Right Side of the Brain by Betty Edwards. I never realized that my chattering monkey brain was such a chicken chirper. One of the first exercises Betty gets you to do is to turn a line drawing upside down and then you copy it, line by line, still upside down, so you can’t start naming the parts – As a consequence, you actually draw what you see – not what you think you see from memory when you allow your pesky left language brain to stick its nose and start causing a racket by naming things! I really do want to try this, I just need to go and buy the supplies! I love what you do! It always makes me smile! Nothing really that fancy is needed Suzanne! Thank you for describing how to get a story map started, It reminds me of learning to write a paper in school starting with an outline and them moving on to a rough draft. I’m looking forward to trying this! This is EXACTLY what I was looking for! I’ve created travel journals all my life. Some include typed, edited versions of my travel notes. Others are mostly photos. 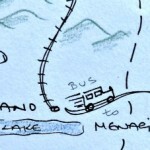 I always include maps, tickets stubs, photos of grandiose landscapes and details of my dinner and the bus trip. But something’s still missing. I’m getting ready for my next adventure and thinking about how I’ll present my memories. And your blog showed me what’s missing: my emotional, immediate reaction to the event. 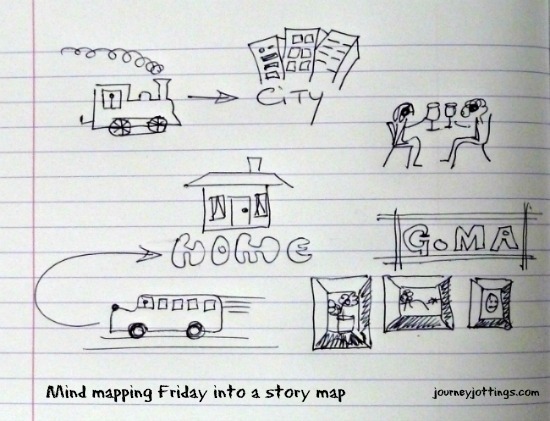 Story-mapping lets me capture what’s important to me in a personal way. Your step-by-step hints and examples are fantastic. I can’t draw, but I can sketch and show my journey, the passage of time and the interesting bits. Thank you for your inspiration! This other post I wrote – Less is More – further explores the use of story mapping, and also demonstrates my love for concertina/accordion journals, which could also be of interest!